I recently bought this sweet dress by Great Plains in the House of Fraser sale. It's very generously cut, light as air and even has some hidden pockets! It's also very versatile, and could even be worn in the winter with a grey or navy cardigan. You could easily throw this over a pair of jeans, but since denim tends to be heavy in the heat, a pair of white or navy linen trousers would be more comfortable. The great thing about printed tunics/dresses is that you can take any colour in the top and use that when choosing the colours of other items in the outfit. I've used a navy hijab and long sleeve top, but it would work equally well with white or another shade of blue. And if you're wary of printed tops, stick to smaller prints as they tend to be more flattering. 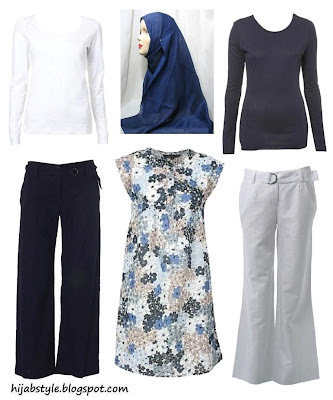 Printed dress £17.50, Great Plains @ House of Fraser; blue long sleeve top £10, Topshop; navy hijab £1.49, 2hijab; white long sleeve top £15, Principles; navy linen trousers £15; white linen trousers £15, both Dorothy Perkins.